Should he sue the person that threw their phone? 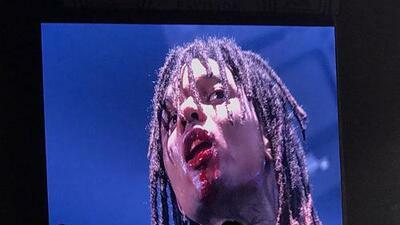 Swae Lee was performing in Dallas at Rae Sremmurd's "Dazed & Blazed Summer 2018 Amphitheater Tour" along with Wiz Khalifa on Sunday, August 26th. Lee was on stage in the middle of performing when suddenly a fan wanted a selfie with the rapper. The fan got fed up with waiting and threw their phone at Lee hitting the 23-year-old rapper in the lip. Lee kept performing his song with a busted lip and tooth. Lee was on video stating that he was going to sue the person that threw their phone, but commented on social media that he was not going to after all. Warning: This video contains explicit language - viewer discretion advised.